Punch in motion, with the side arm of the advancing leg. Punch in motion, with the arm on the opposite side of the advancing leg. Punch with the hand in a lateral position (thumb pointing up). Punch with knuckle down, como on kata Saifa. Double Punch, como on kata Dai Ichi Gekisai. Parallel Socos,como to kata Saifa. Ura Tsuki de Lado,como to kata Saifa. 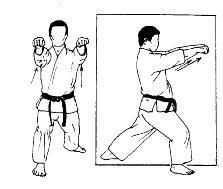 Sharp blow with the open hand horizontally, palm facing up, como on kata Dai Ichi Gekisai. Soco ascending, como on kata Kururunfa.